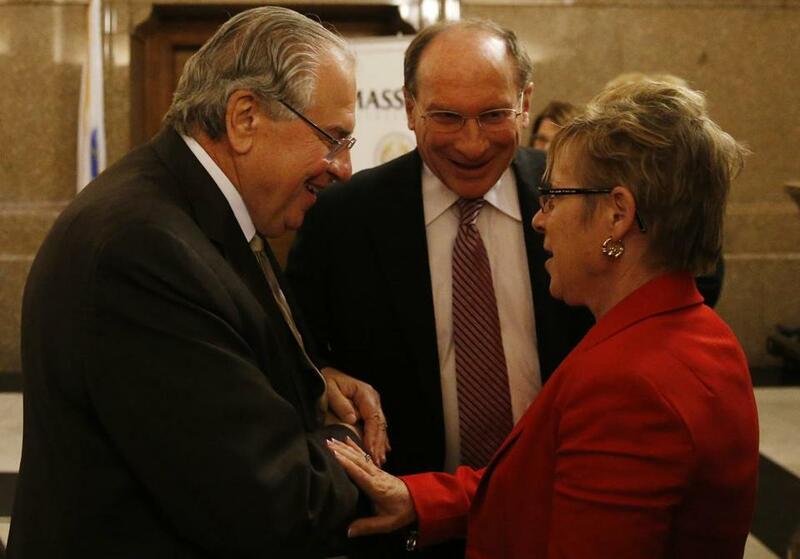 House Speaker Robert DeLeo (left) met with Supreme Judicial Court Chief Justice Ralph D. Gants and Chief Justice of the Trial Court Paula M. Carey Tuesday. Supreme Judicial Court Chief Justice Ralph D. Gants on Tuesday proposed a data-driven strategy to reduce Massachusetts’ incarceration rates, saying in his annual State of the Judiciary speech that the state should offer more rehabilitation programs for inmates and better monitor them once they are released from prison to make sure they do not return to a life of crime. “I am confident we can find common ground with the Legislature and the governor on ways to be smarter on sentencing so that we can reduce both the rate of incarceration and the rate of recidivism,” Gants told lawyers and legislators at the Massachusetts Bar Association’s Bench-Bar Symposium at John Adams Courthouse in Boston. For the second time since he was named chief justice in July 2014, Gants used the annual address to issue a call for sentencing reform. In a wide-ranging speech, he proposed increasing the amount of good time inmates can earn in prison and promoted so-called step-down programs that help inmates adjust to life in society before their release. Last year, Gants called for an end to mandatory-minimum sentences that force judges’ hands, regardless of the evidence of the case or the defendant’s background. Such sentences have not been abolished in the state but have become a focal point in criminal justice reform efforts. “I am committed to follow the data and allow it to drive the analysis, letting the chips fall where they may,” he said. Already, Gants said, the data collected in the study have shown that 46 percent of those released from state prisons in 2012 received no parole or probation supervision — one of the highest such rates in the nation — leaving the inmates with little resources once they reenter their communities. Of those released on some type of supervision, more are on probation rather than on parole, meaning they are subject to less strict supervision. Gants called for more leeway to allow judges to sentence convicts to some type of post-release supervision. “The goal is to ensure that each judge who imposes a sentence has the information needed about the defendant and the crime to determine an appropriate sentence and, where probation is imposed, to determine which conditions will best address the particular needs of the defendant,” Gants said. He said legislators should look at other ways to help defendants before their release. Robert W. Harnais, Massachusetts Bar Association president, praised Gants for “bringing vision back to the bench.” For instance, he praised Gants’s proposal to eliminate fees defendants have to pay the courts. “We’re spending dollars to collect nickels when it comes to fines,” Harnais said. He also embraced Gants’s proposals for sentencing reforms. Milton J. Valencia can be reached at mvalencia@globe.com.Follow him on Twitter @MiltonValencia.